Given that the IPO market has heated up in the last few years – 2013 brought us 222 IPO pricings in the U.S., up almost 80% from 2012(1) – we thought it worthwhile to look at pre-IPO equity practices and the implications for companies after the initial offering. We start with some analytical findings for recent technology and general industry IPOs, followed by a list of ten key planning considerations as companies consider their post-IPO futures. Our analysis is based on prospectus filings by companies at IPO. As such, these companies represent those pre-IPOs that were able to successfully conduct an initial equity offering. In addition, we limited our study to non-founder CEO companies because founder compensation often has unique aspects, which could have distorted the findings. In total, we looked at 40 pre-IPO companies. Since the general industry companies that conducted IPOs during 2012-2013 tended to have a larger market capitalization at IPO, we selected technology IPOs from the 2007-2012 timeframe that had similar market valuations at offering. 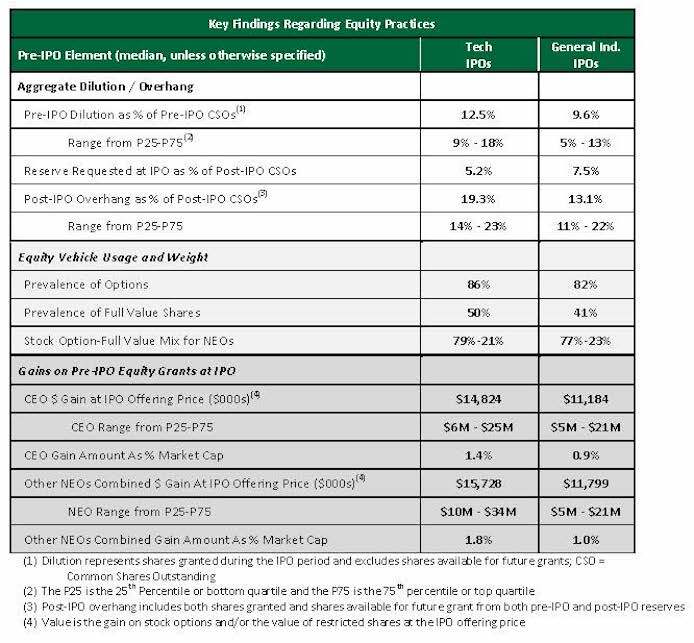 The table below summarizes our findings for the Technology and General Industry IPOs with respect to: a) equity dilution/overhang, b) equity vehicle usage, and c) gains to executives at the IPO offering price. There are many changes associated with the transition into a publicly traded company with many shareholders with diverse investment horizons, other stakeholders, and SEC reporting requirements to manage. Below is our Top 10 list of planning considerations in the area of compensation and governance. ‍1. Are the executive equity stakes large enough and “sticky” enough post-IPO? Investors and Wall Street like to see meaningful equity stakes for senior management that show they, and especially the CEO, have “skin in the game” coming out of the IPO. This strengthens alignment between management and shareholder interests and also provides retention post-IPO. Therefore, it is important to evaluate the size of the equity stakes and the vested and unvested portions as the company moves towards an IPO. ‍2. What should the go-forward equity granting strategy be? Most pre-IPO companies make intermittent equity grants (either at hire or tied to special events like promotions). However, most public companies make annual grants—which provides for dollar cost averaging over time and a steady stream of unvested equity to enhance retention. Most companies switch to an annual grant approach immediately post-IPO. However, there are certain circumstances which might argue for up-front awards instead. One situation is if the executives do not have significant equity stakes at IPO; in this case, the Board may decide that the first post-IPO grant should be front-loaded to cover the next few years. Any new equity strategy should fit within a broader overall compensation philosophy, which also may be a new consideration. A compensation philosophy typically includes target market position, desired mix of pay and other guidelines to inform future Committee decisions and align them with ongoing strategy. ‍3. What types of vehicles should be used going forward? Can the company reliably set performance goals? Eventually, public company shareholders like to see the use of performance shares, but an effective design requires the ability to select the right metrics that correspond to value-creation, and to set performance goals with a high degree of confidence. 4. Should an all-employee “founders” or “celebration” grant be made at IPO? How will a broad-based grant affect dilution and the share reserve? Did employees broadly participate in the pre-IPO equity? If so, an IPO grant may not be needed. Is there another vehicle for broad-based post-IPO equity participation such as an Employee Stock Purchase Plan? 5. Should a post-IPO peer group be established for external comparisons? As a post-IPO company, establishing a post-IPO peer group of reasonably similar sector/size companies is often helpful to provide some external context on the talent market. Among other uses, it allows new post-IPO companies to understand competitive pay levels, practices, and dilution levels. Proxies also provide useful information on incentive designs and metrics used for incentive purposes. Generally, we recommend using peer group data as one, and not the only, factor in making pay decisions. 7. Are executive employment contracts necessary? If the CEO and senior executives do not have contracts pre-IPO, the Wall Street advisors often recommend contracts post-IPO to “lock executives in”. On the other hand, shareholder groups and proxy advisors do not favor contracts. Because of proxy advisor and shareholder pressure, many post-IPO companies have reduced their use of executive contracts, especially for non-CEO positions, and moved towards using broader termination and severance policies instead. If contracts are adopted at an IPO, it is important to avoid obvious shareholder irritants (like evergreen contract renewals, 280G excise tax gross-ups, and single trigger change-in-control severance and equity vesting), and to leave room for future flexibility. Further, incentive compensation should be expressed in terms of target opportunity subject to change / adjustment rather than promised future grants. Similarly, the use of supplemental executive benefits and/or perquisites should be reviewed closely, as such practices, while typically small in value, can be highly scrutinized. ‍8. What features should the post-IPO Equity Plan contain? 9. 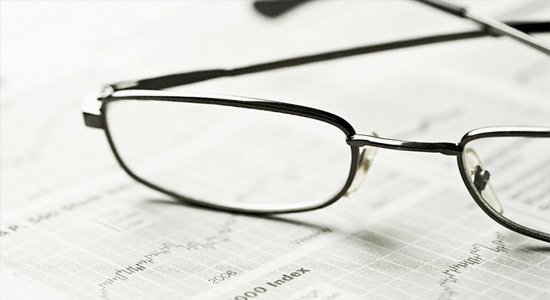 What kind of annual proxy disclosure will be needed? Relatively little attention has been given to the JOBS Act within the compensation world. Signed into law in April 2012, it allows qualifying companies to enjoy significant advantages with respect to disclosure requirements. As such, it is an area worth investigating to see if your company qualifies. In general, eligibility is for emerging growth companies with under $1 billion in total gross revenues (but is also affected by the size of convertible debt issuances and of a company’s public float). While covered under the Act, a company can use abridged proxy disclosure and it not subject to a Say-On-Pay advisory vote. Whether subject to the JOBS Act or not, it is a good idea for the new Board to articulate a compensation philosophy—i.e., the rationale for why executives are compensated the way they are. That rationale is the important ingredient to framing the pay-for-performance story in the first proxy. ‍10. What processes will be needed post-IPO? Making the transition from pre-IPO to post-IPO is a very exciting time for a company. While the executive compensation requirements may seem daunting, addressing these ten items will put organizations on the right path towards their post-IPO compensation futures.